Where were you 20 years ago? Were you fortunate enough to be at Yankee Stadium? Were you watching T.V.? Were you listening on your car radio? 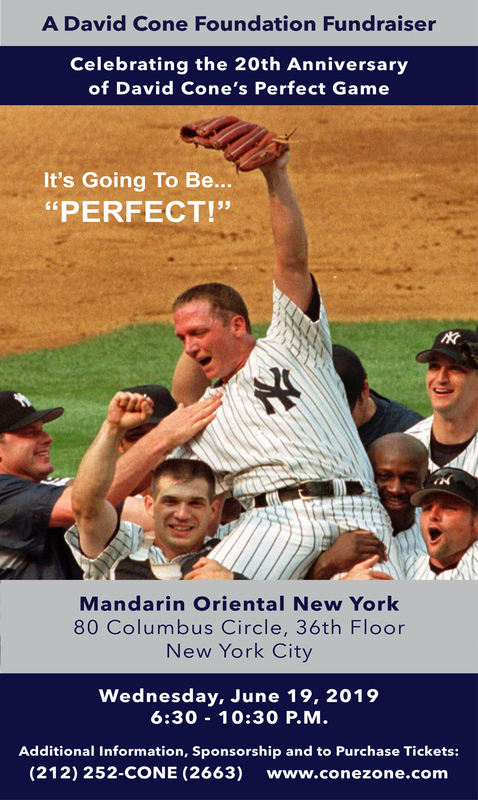 Regardless of where you were partying like it was 1999 on that date, please join us to celebrate that momentous day of perfection: the 20th anniversary of David Cone's Perfect Game. Put on your best smart casual attire and join us on the 36th floor ballroom of the Mandarin Oriental New York. The evening promises to include a "Who's-who" of attendees from the baseball world such as Yankees Legends, David's teammates and Yankees broadcasters who will toast David's achievement. In addition, family members, friends, celebrities and supporters will gather for an evening of cocktails and full dinner, compelling and humorous stories, endless laughter, elite entertainment and a night that will be almost as memorable as the Perfect Game. For additional information on sponsorship packages or to donate a specific amount not listed below, please contact us.